Score A Book Join the Team for 2018! Now available, you won’t want to miss out on this great opportunity. Your donation will be part of the effort to turn temporary bleachers into a Stadium and a virtual museum into a Baseball Learning Center for fans of all ages. Casey Stengel was a very good major league baseball player and a fantastic manager. He was a great collector of baseball memorabilia from the time he entered Baseball in 1910 with the Kankakee, Illinois professional club at the age of eighteen. Throughout Casey’s baseball career it was his dream to develop a museum to display the history of Baseball. As his career grew his desire never died. Now, over One Hundred Years from his entrance into the Major Leagues, his dream is becoming a reality. 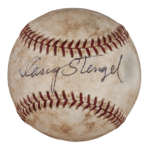 We, at the Casey Stengel Baseball Center, see a need and relevance for his life’s story for all generations, past, present and future. Casey’s Baseball Center has been established as a nonprofit educational organization to promote the ideas, ideals, character and values of America’s Premier Pastime. Casey Stengel’s historical accomplishments, fame, wisdom, and extraordinary sense of humor serve as a catalyst for the Baseball Center’s initial mission, as a sports’ based educator in team building. It has been one of Casey’s wishes to continue the education of people, of all ages about this fantastic game of BASEBALL. We welcome and encourage you to join us in preserving the many fine qualities exemplified by “The Ole Perfessor”.